This has been one of those weeks where I find myself saying “what, Thursday already?” Since it’s almost the weekend again, I suppose it’s about time that I post about what I did last weekend. 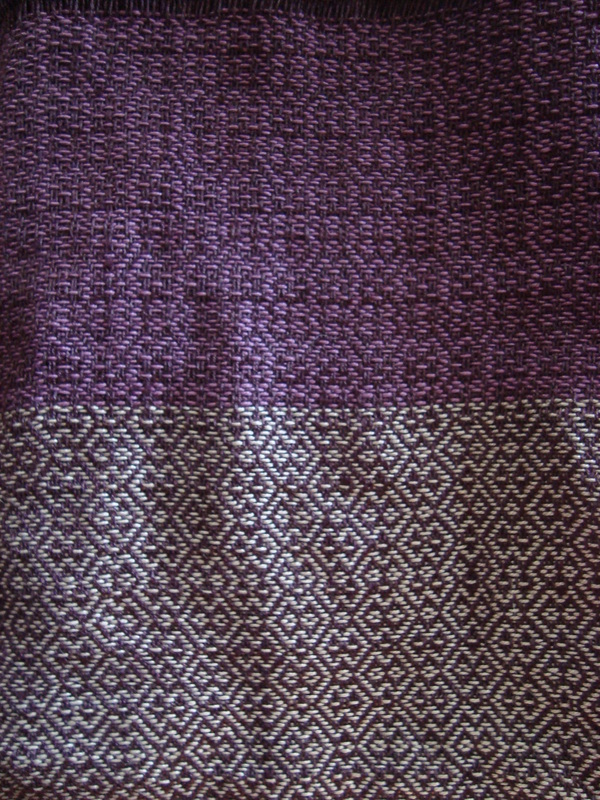 First, I finished up the leftovers from my doubleweave workshop. 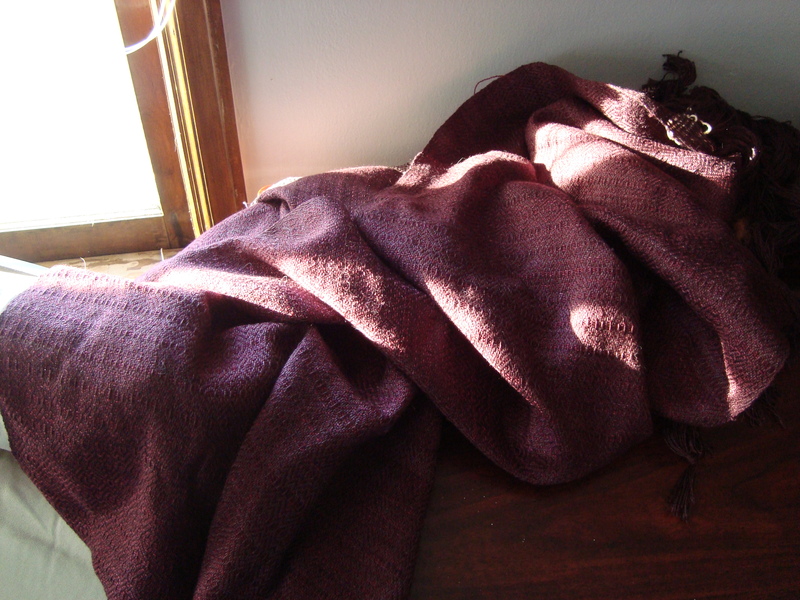 There were about 2 yards of warp left over, and the fabric was only about 4 inches wide. What do you do with such a small strip of fabric? Well, I made coasters. 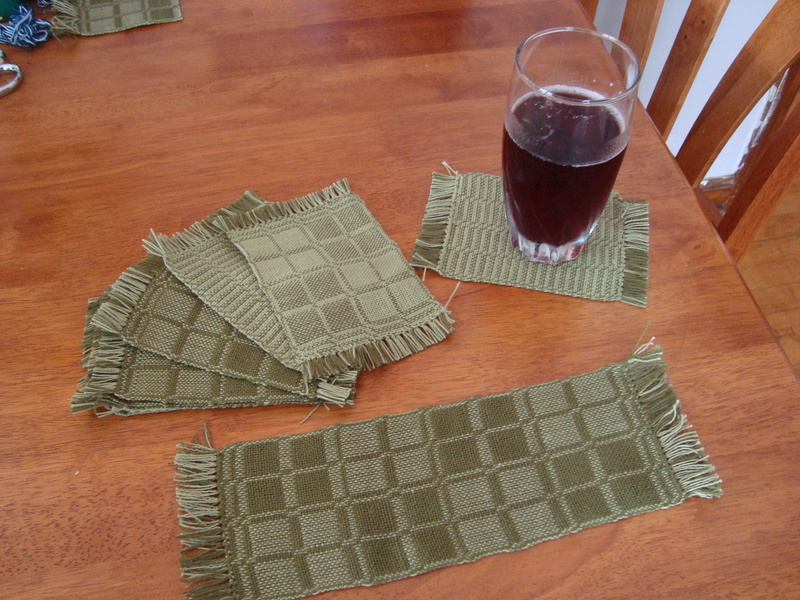 I made some with a dark weft, and some with a light weft. And then I repeated the edging pattern over and over again to make one that looks like it has zigzags all along it (those are my favorites). 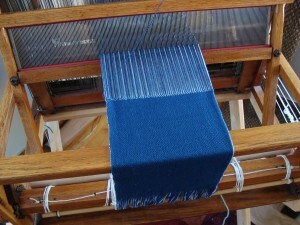 Then, I wove the last few feet of warp on the big loom, so that it will be ready to return next weekend while we have the truck to move Branden to Chicago. I can’t remember if I’ve blogged about this one before. It’s a rayon warp, with Madeline Tosh laceweight as the weft. The colors are very similar, but the two yarns look different in the light, and the subtle color gradations in the laceweight make for pretty contrast. At the end, I had a few feet of warp left after I ran out of laceweight, so I switched to cotton and did some playing around. These are two different patterns that use the same warp threading, and you just lift the threads (treadle) in a different way. 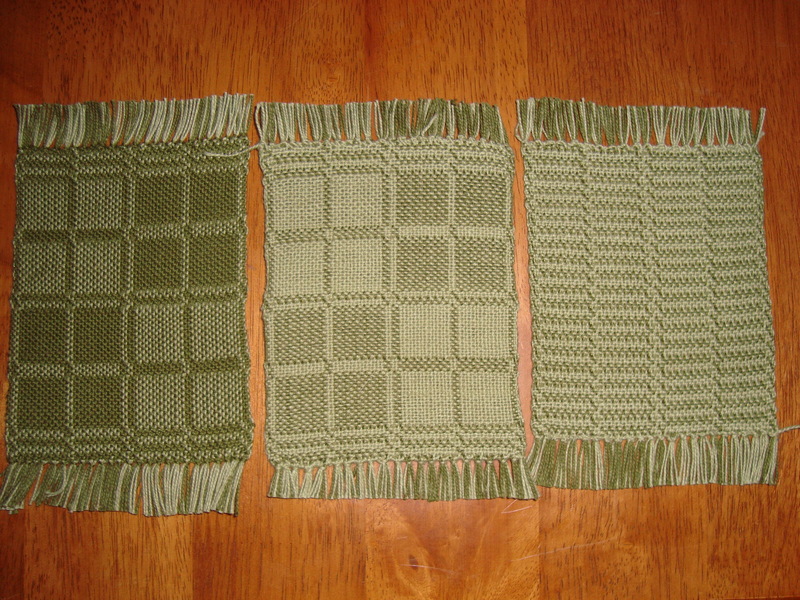 It’s interesting to me how much difference the weft color makes. 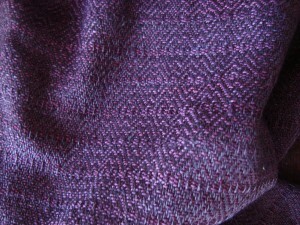 I really love the dark laceweight, and the off white, but I don’t really care for the medium toned purple. The colors go well together, but I don’t like the way they interact with the pattern; I find it very hard to see. The off white looks great, though. I think I got enough of that one to make something with it, too. I think the final finishing on these will probably have to wait until after the move. I did manage to hem stitch the ends of each of the coasters, but these larger pieces will take a little more time and work to get done. Still, I’m excited to know that they’re almost ready to use! Once the coasters were finished, the little loom was left empty. We can’t have that, so this week I’ve been working on threading up a new project. 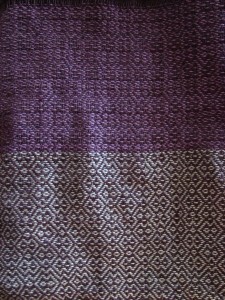 This is a new doubleweave warp. The first part wasn’t behaving quite as nicely as I wanted (I was trying to work too close to the end to avoid waste), so I wove about 10″ that I think will probably become a drawstring bag of some sort. I finished that just before leaving for the bus this morning, and now it’s on to potholders. So that’s my weaving progress report. Two things off the loom, and another on. I wonder what I’ll get done this weekend? More tempting weaving projects! I love the coasters. I’ve been wondering about what would make a good coaster lately–my mom has a couple ceramic sets that my dad keeps breaking and he tried to convince me to get her new ones for mother’s day. It seems woven coasters like these would be more practical. Have a good weekend, whatever you get up to! DesigKnit is powered by	WordPress 4.8.9 . Page generated in 0.277 seconds using 35 queries.